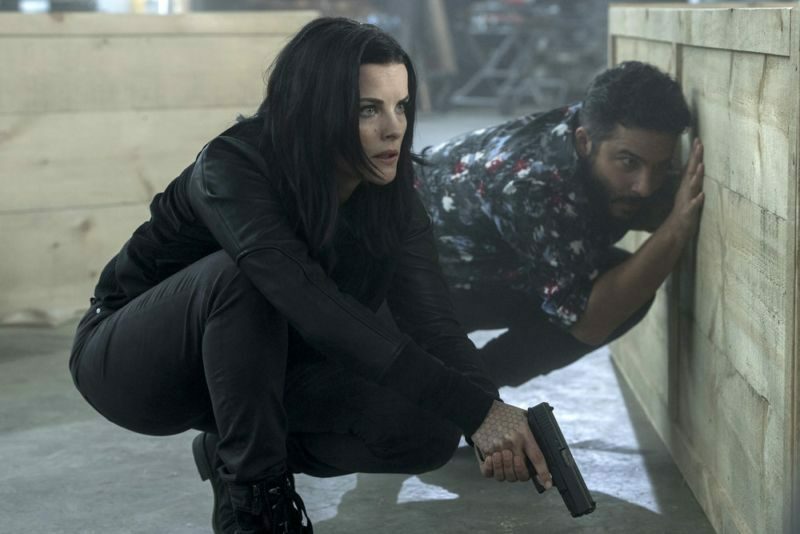 Blindspot forces us to question what a happy ending means to Jane Doe in "Adoring Suspect." My answer may be surprising to some of you. One of Jane's tattoos matches the logo of a Russian production company named Sacred Lynx Productions. They are a major backer of Keith Rhodes movies, the Blindspot version of Tom Cruise. Unfortunately, Sacred Lynx Productions is run by Nico Popov, leader of the Brigada (an international terrorism syndicate). Nico never leaves Moscow unless he's scouting an attack. So when Popov is spotted in a photograph with Keith Rhodes, the team knows there's an attack imminent on U.S. soil. Kurt poses as an FBI consultant for Keith's latest movie, and away we go! All the locations used to shoot Keith's movies are all home to major weapons plants. The Brigada uses international film productions to transport weapons of mass destruction to the target cities. Keith's latest movie was filmed in Omske, where they make Cyclosarin: a nerve agent with no antidote. The ending is a foregone conclusion. Team Blindspot stops the Brigada from dropping a nerve agent on New York City. But we do get Jane and Rich undercover. Rich poses as a screenwriter and pitches his movie to Booky Bentley. The team needs Booky to say certain words so they can break into his safe. Rich's improvisation is solid gold hilarity from start to finish. Patterson and Zapata loop Jeller in on Hirst being the source of all evil. Unlike Reade, it doesn't take much to convince Kurt and Jane. They've danced this dance before. If Patterson says Hirst is dirty, then she's dirty. Zapata wants to start building their own database of Jane's tattoos outside of the FBI and out of reach from Hirst. They need the metal disc that triggers Jane's new tattoos and that's in lock-up. Zapata comes up with a CIA way to sneak the disc out (inside a flask), but Reade interrupts and takes the flask from them. He insists they have Hirst's back because she has theirs. Boy, really? You are trying my patience, sir. Since when do you throw Zapata overboard for Hirst? What planet am I on? What color is the sky in this new world you've created Reade? To his credit, Reade does question Hirst on her relationship with Kevin Loewe. One of Jane's tattoos lead to some dirty dealings by Loewe and Hirst never disclosed that she went to college with both Loewe and his wife. However, when Reade pushes for more information on their relationship, Hirst not so subtly threatens to reveal Reade's past drug use. Two seconds later, Reade is at Weller's door with the flask and disc in hand. Weller tells Reade he's a little late the party and opens the door. Operation Stop Hirst is in full swing. YASSS! I love all my children united. Take that, Roman. And the lies continue, but we knew they would. Jane tells Patterson that she's not going to pursue finding her daughter, saying: "This girl has been living her own life for 18 years without me and all the stuff that comes with me. Whatever she's doing, I'll just make everything more complicated for her." Patterson responds, "But maybe she's looking for the truth." I love you, Patterson. Never change. Patterson gives Kurt the contact information of the nurse who helped deliver Jane's baby. She wants Kurt to check it out and is absolutely confident that if there's anything there, he will immediately tell Jane. Unfortunately we, as the audience, are not so confident. This is such a sad feeling because we want to have faith in Kurt and believe he's doing the right thing. His intentions may be good, but that doesn't make what he's doing any less wrong. Surprisingly, Rich Dotcom offers Jane some wonderful advice on the whole missing daughter dilemma, saying: "I just feel like your story deserves a happy ending." Rich believes if Jane finds her daughter, she'll find the happiness she deserves. But Jane believes she's already found it in Kurt. Sadly, we can't even enjoy the smooches and the heart eyes because now we're in on Kurt's dirty little secret! You took my heart eyes from me, Weller! What has become of us? We are mere shell of what we once were. FIX IT NOW. Blindspot seems to be implying that Jane's happy ending will either be her daughter or Kurt, but I don't believe that's the case. She can have both and absolutely needs both of these people in her life. However, I don't think Avery or Kurt can give Jane the happy ending she seeks. That has to come from inside. Even in her life with Kurt in Colorado, Jane was restless. She needs to help people. Being Kurt Weller's wife and only his wife, wasn't enough for Jane. She needs something to define herself outside of their relationship. It will be the same as motherhood. It's okay to find something outside of your children to define yourself with. Just because you are a mother doesn't mean you suddenly have no other interests, ambitions, or desires. It's good to explore them and, more often than not, it makes you a better parent. Jane continually looks to other people to fill the holes inside of her. First it was Taylor Shaw, then Oscar, then Roman and Sheppard, and finally Kurt. Jane found the most joy and peace with Kurt because she is the best version of herself when she is with him. That doesn't mean Kurt Weller will fulfill every need Jane ever has though. The same can be said of Avery. Jane is convinced Avery is better off without her and no amount of love or encouragement from Kurt has changed her mind. This self-hatred is something Kurt's love can help, but it can't fix. Not entirely. What Jane needs is to find a sense of peace and acceptance within herself. Weller and Avery can be part of that process, and will help immensely with getting Jane there, but ultimately she has walk some of this path alone. Jane has to sort out what or who she needs to be happy and fulfilled. And she can't always look to Kurt for the answers. Kurt is her starting point, that's true, but he doesn't have to hold her hand every step of the way. And if Kurt understands that then he'll realize he doesn't have to lie to Jane to protect her from pain. Kurt needs to let go a little of Jane, as terrifying as that sounds. He doesn't have to fix everything or have all the answers. Kurt just needs to be there like a save haven. The problem is, Kurt is terrified if he lets Jane fly then she'll never come back. It's ultimately a self fulfilling prophecy. Kurt is robbing Jane of the security she so desperately needs to be brave enough to face all the unanswered questions inside of herself. Kurt's lie is going to damage his relationship with Jane severely. However, I don't believe we are dealing with seasons one or two Kurt and Jane. They may break, but I don't believe the relationship will be broken. I don't believe we'll be headed for divorce court. This is all part of the Blindspot puzzle. Kurt, Jane, Avery, Jane's self acceptance, Kurt letting go — these are all pieces of that puzzle. The trick is figuring out how they all fit together. But they will. Eventually, they'll see the full picture, and that's when Jane will have her happy ending. Roman continues his manipulation with Blake. I want to ship it so much, but he's just so evil. There are days when I want to love Roman, but then I remember he killed Tom and deprived me of more Daniel Lissing. I just cannot forgive him for that. Can we have an episode of Roman and Kurt hanging out and speaking in Australian accents? We can bring Tom back to life too. They can all grab a beer. That's solid television. "Destroy her? Or her love for you?" Sorry Kurt, it's 100% the latter. Roman nailed you on that one. "It's what we on the dark web call the good stuff." I cackled. More Rich Dotcom always please. "Oooh... I see." Patterson is like Penny from Inspector Gadget. Maybe she should join the CIA. Could we not fire guns around chemical weapons? That be neat.